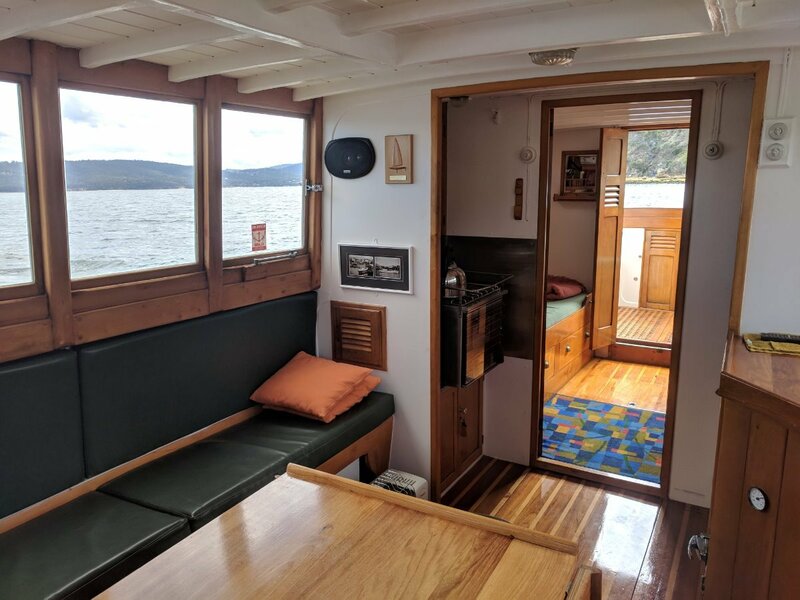 A TRUE PART OF TASMANIA'S RICH MARITIME HISTORY, in fact this beautiful vessel is on the Australian Register of Historic Vessels. 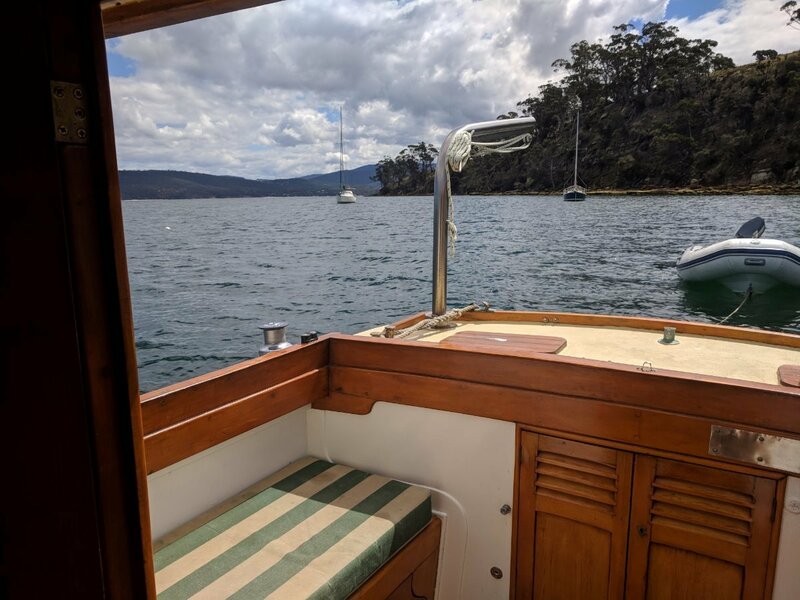 Designed by Mr Featherstone and built by his company the famous PURDON AND FEATHERSTONE yard of Battery Point in HUON PINE with king billy pine decks and excellent use of timbers down below. 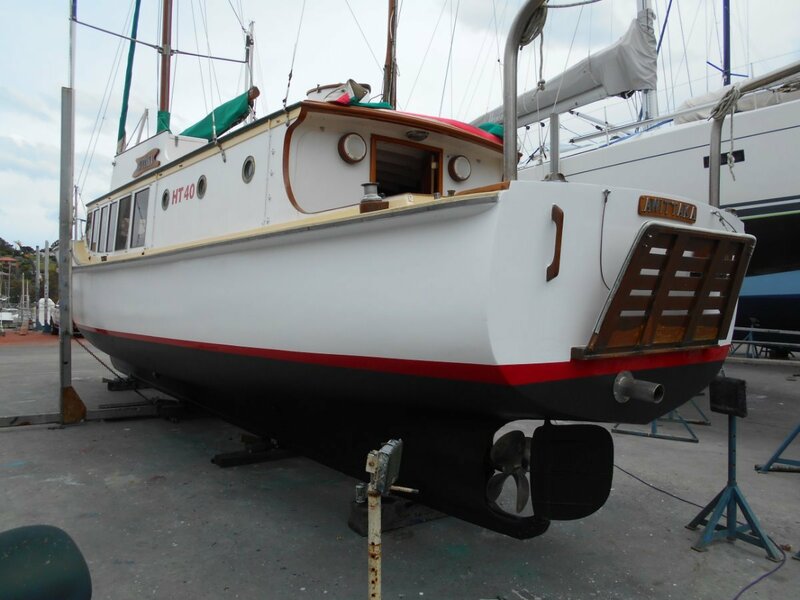 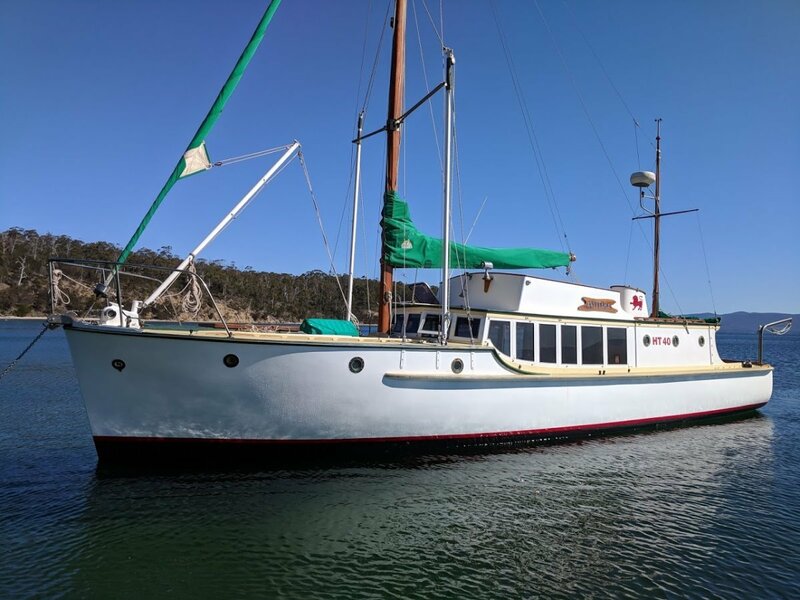 The design can be best described as " a motor launch with sails" and is from the era of well designed and built classic local river/channel cruisers being very capable of carrying a reasonable number of people in real comfort. 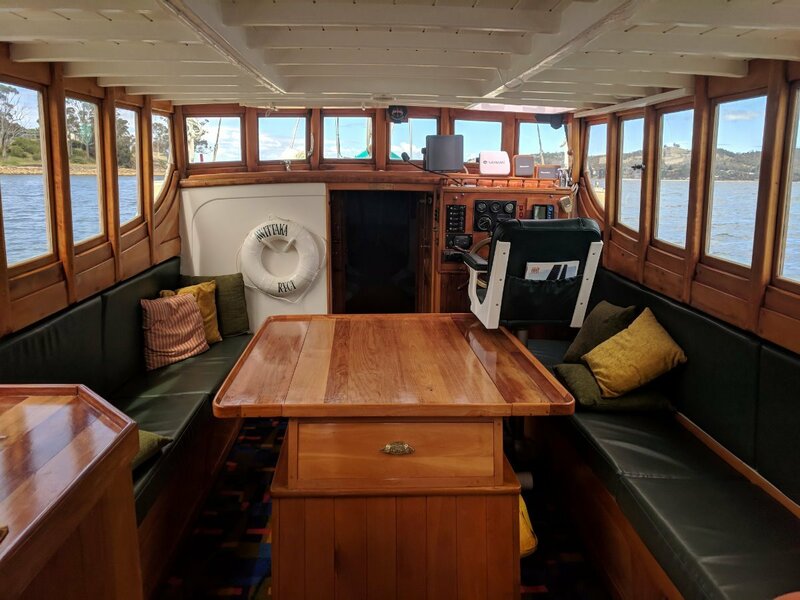 The superb quality of the timber fitout needs to be seen to be appreciated as it gleams, but a summary of the layout is as follows. 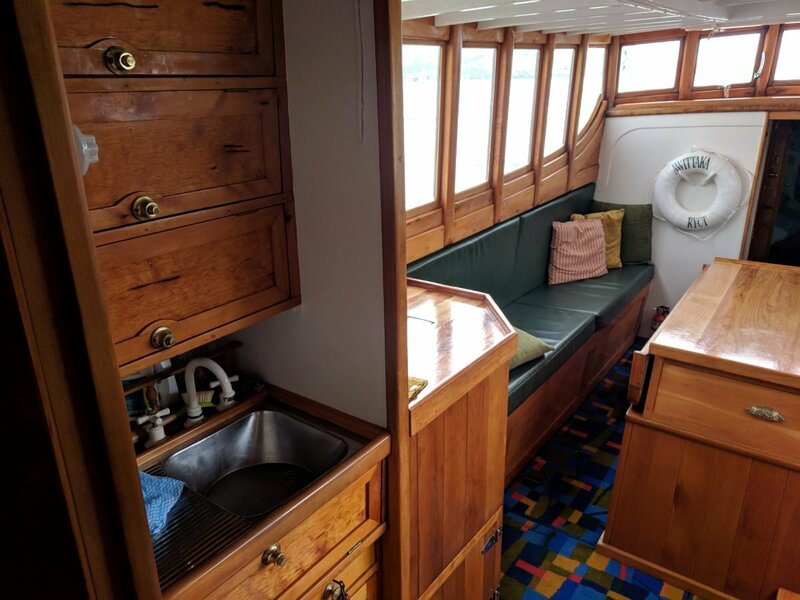 The main cabin has the very functional galley to port, large table ( is also the cover over the engine providing great access), 2 settees either side that provide two single berths then for'ard again to the helm station with all instruments ( excellent electronics ) and controls with chair and hatch above, enabling the whole crew to travel together when underway, then for'ard again to a full bathroom on the port side and a wash room with hand basin and lockers on the starboard side. 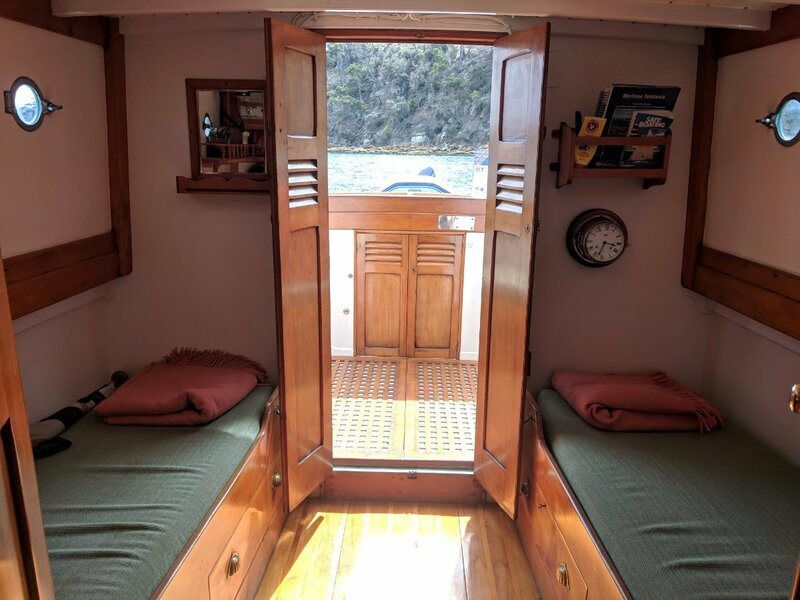 A double vee berth with infill is in the for'ard cabin and two other single berths are aft of the main cabin, providing very comfortable sleeping accommodation for six. 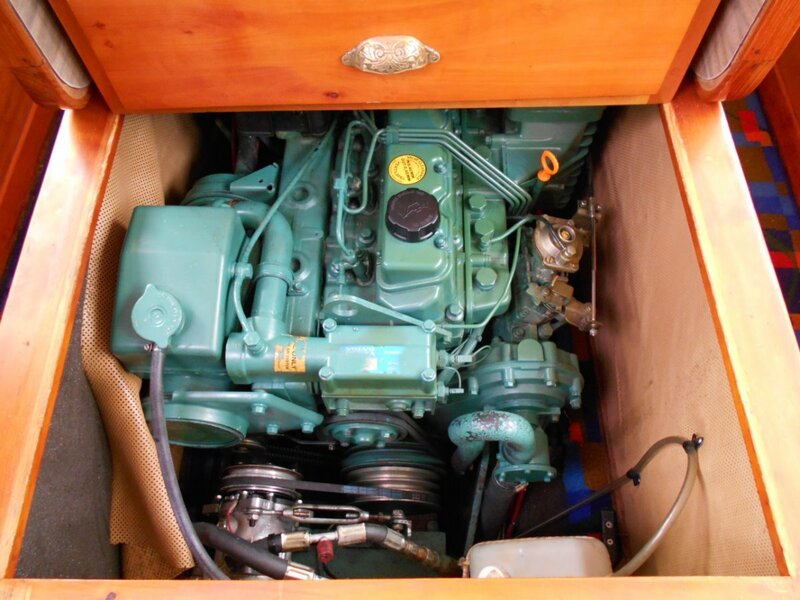 A new 140HP Volvo diesel motor was fitted in the mid1990's, this provides economical cruising at 9 knots with over 10 knots being achievable. 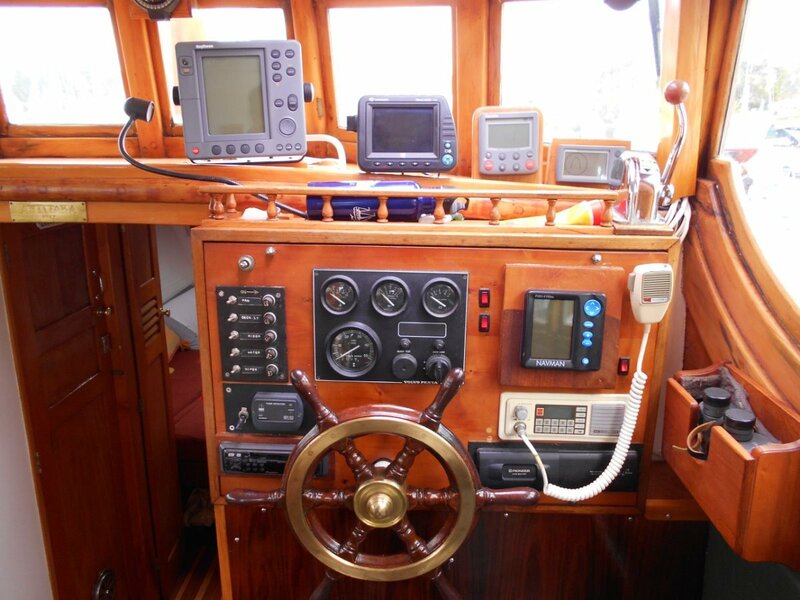 The quality Raytheon electronics cover all needs and are within easy reach of the helmsman's chair. 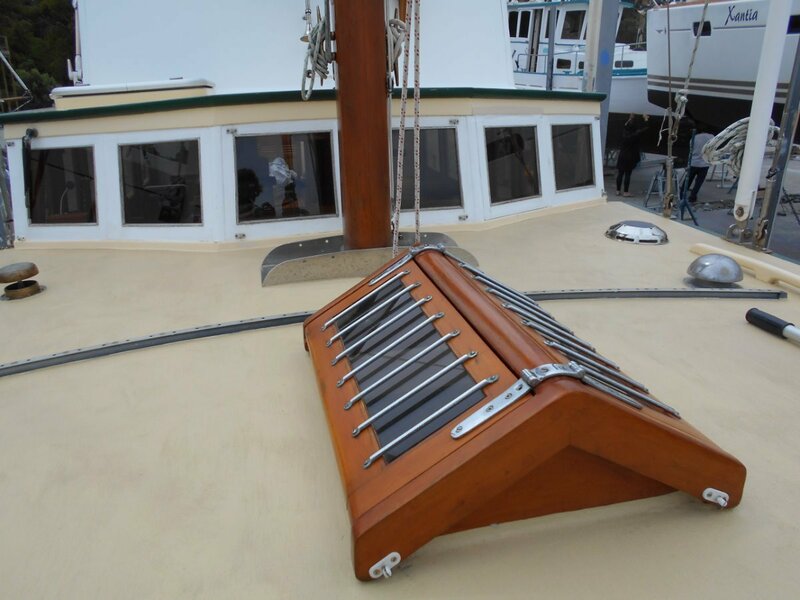 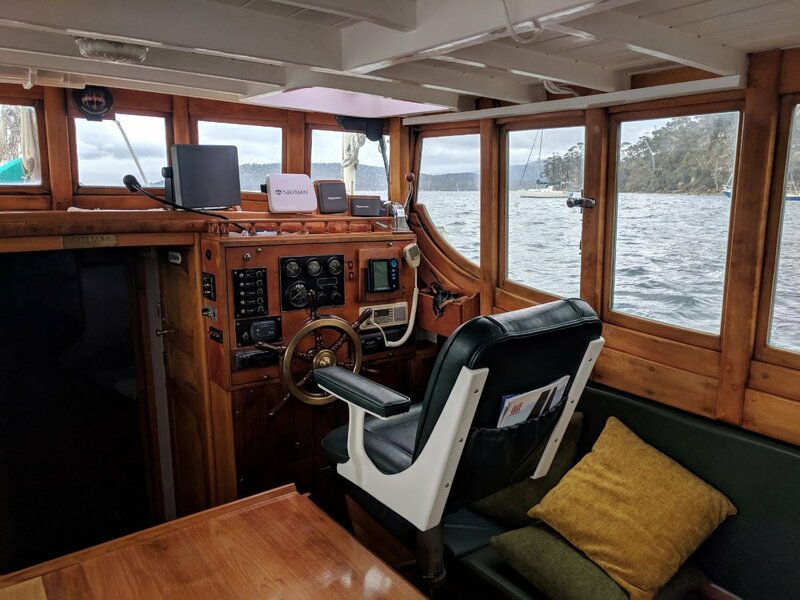 The 2019 TASMANIAN WOODEN BOAT FESTIVAL is on this coming February and this would be a great part of the show. 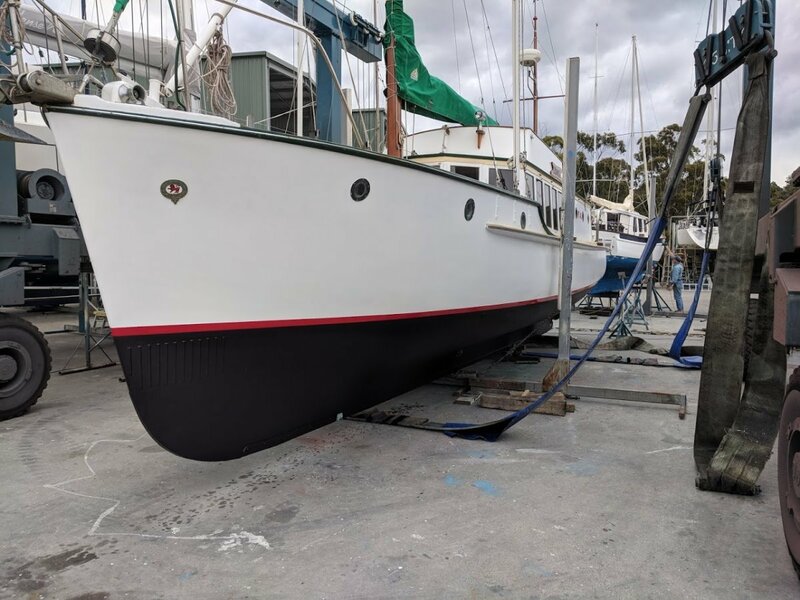 Don't miss this GREAT OPPORTUNITY, please call John Radonic on 0459 322 862 for more information. 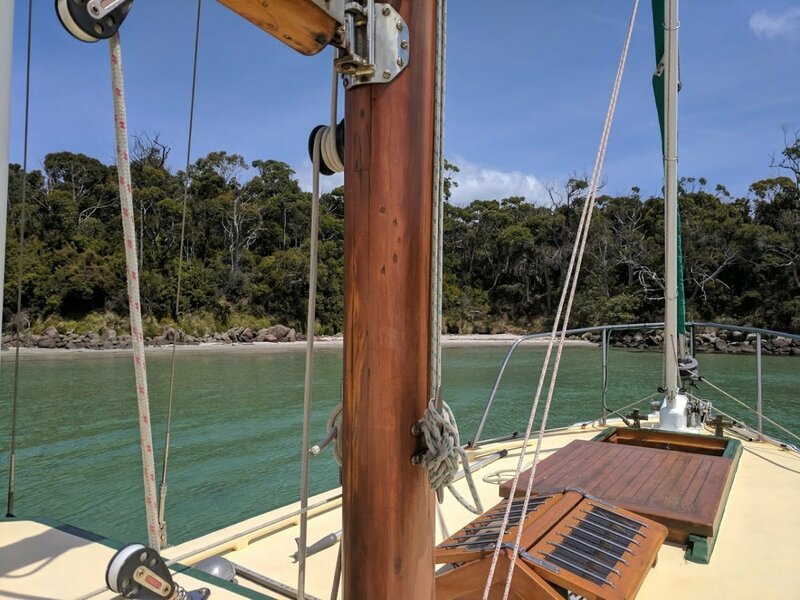 3L per/hr at 6 knots, 6L per/hr 10 knots approx. 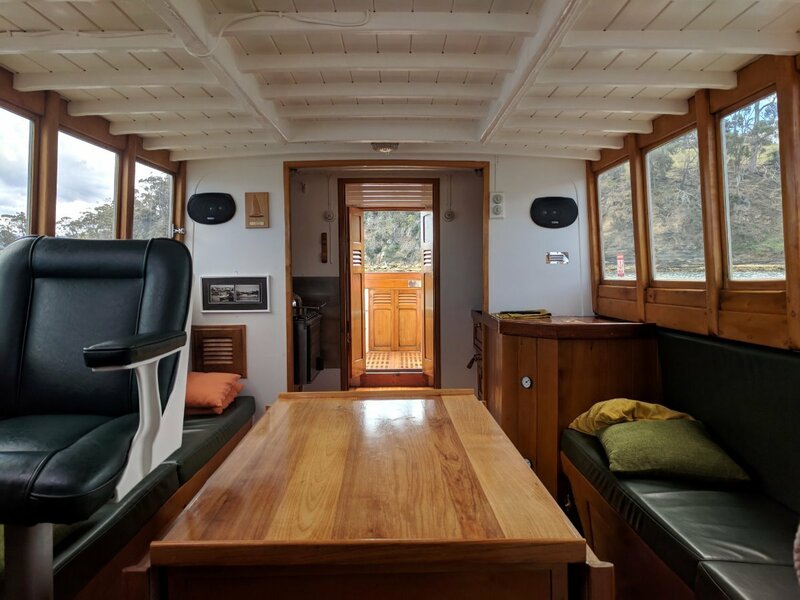 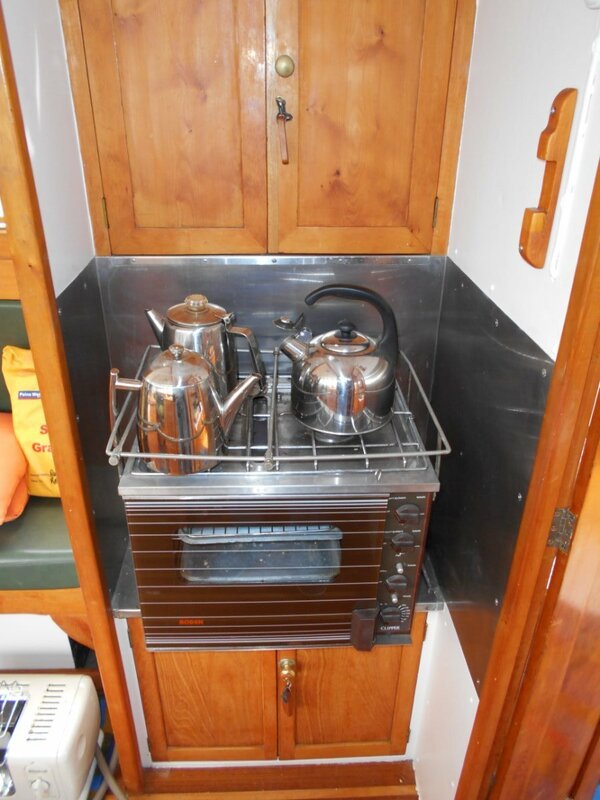 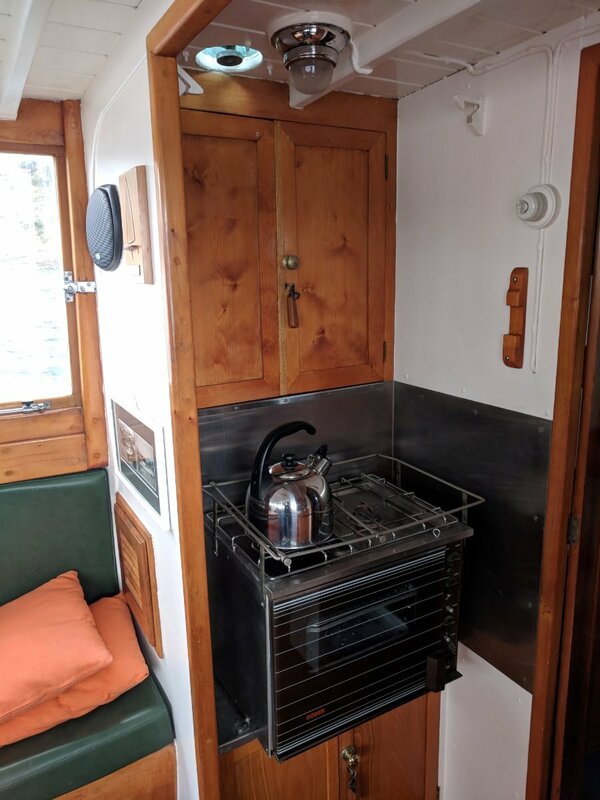 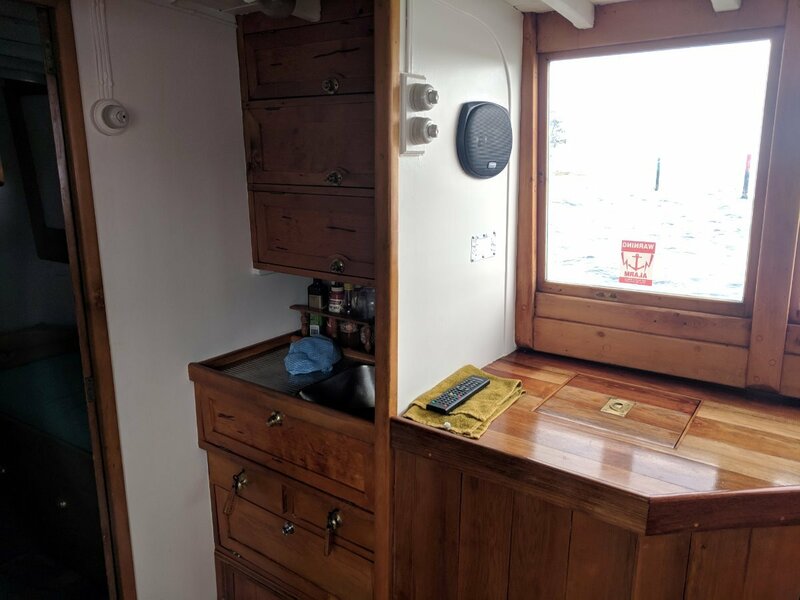 At the aft end of the main cabin is the Galley area including Fridge and Freezer, 2 Burner Gas Stove with Oven and Grill, Stainless steel sink with H/C Pressurised fresh water and good storage with lockers, draws and racks. 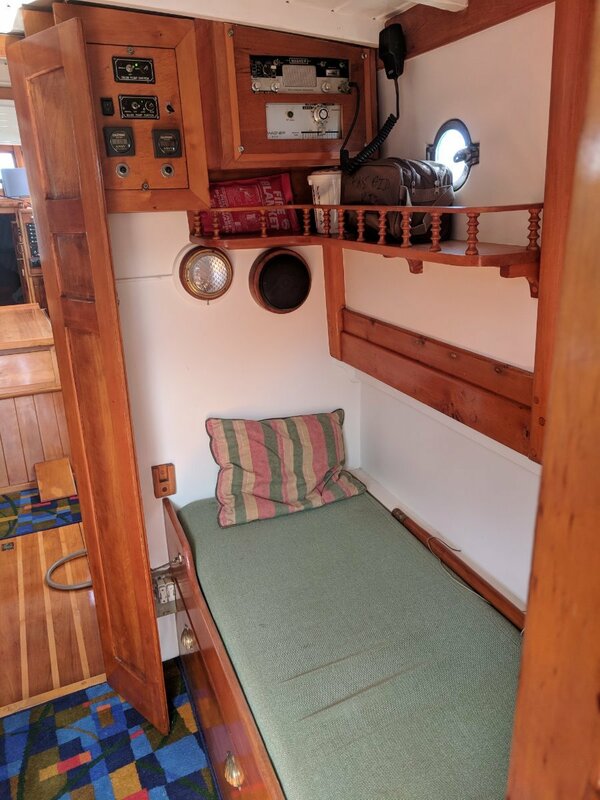 The layout is stowage for'ard with cable locker below, Double V-berth with infill in for'ard cabin with stowage under. 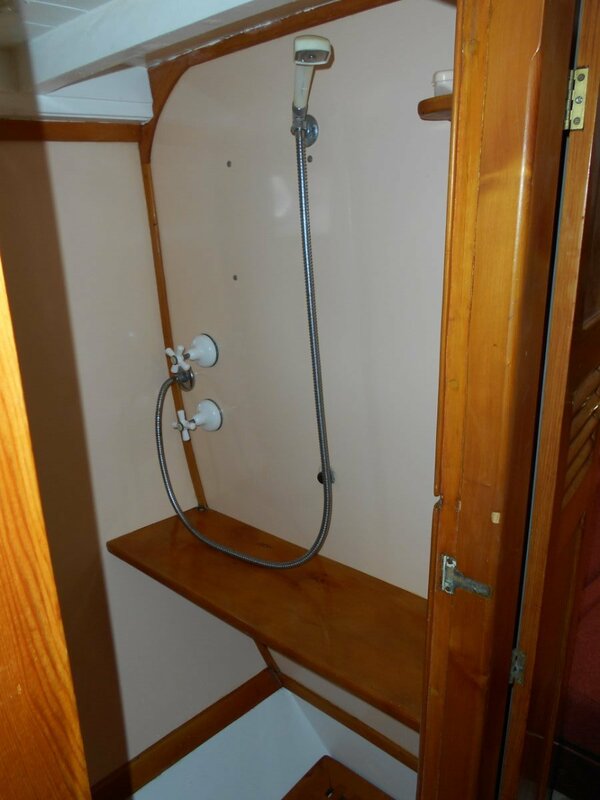 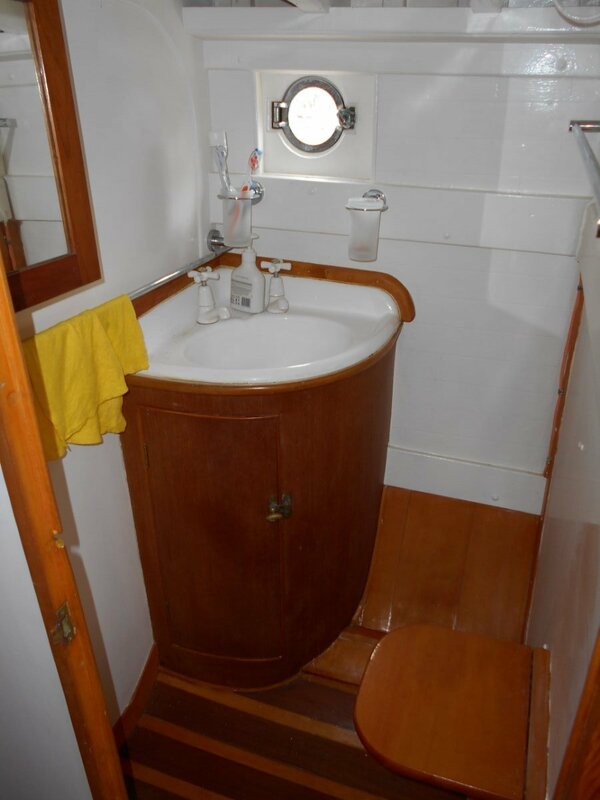 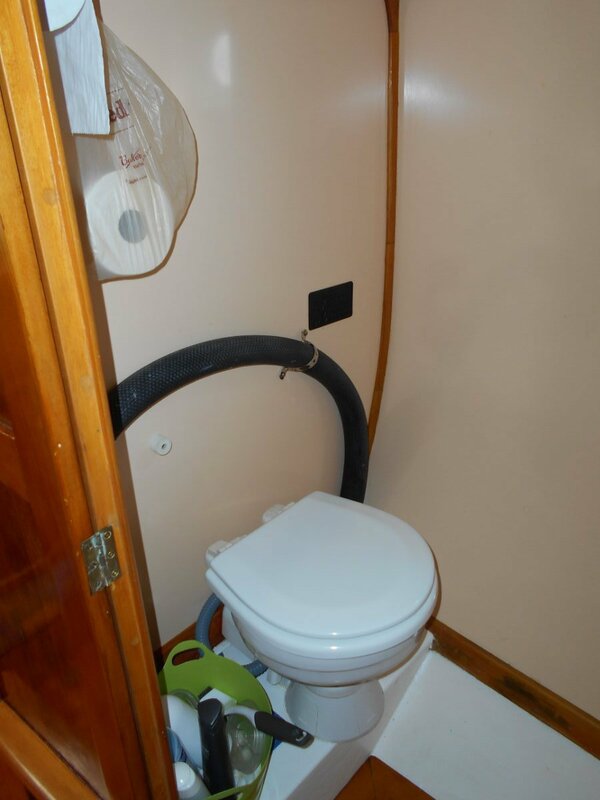 Aft to port is a fully enclosed head with Electric toilet and Shower and to starboard is an enclosed Wash room with Hand basin and lockers. 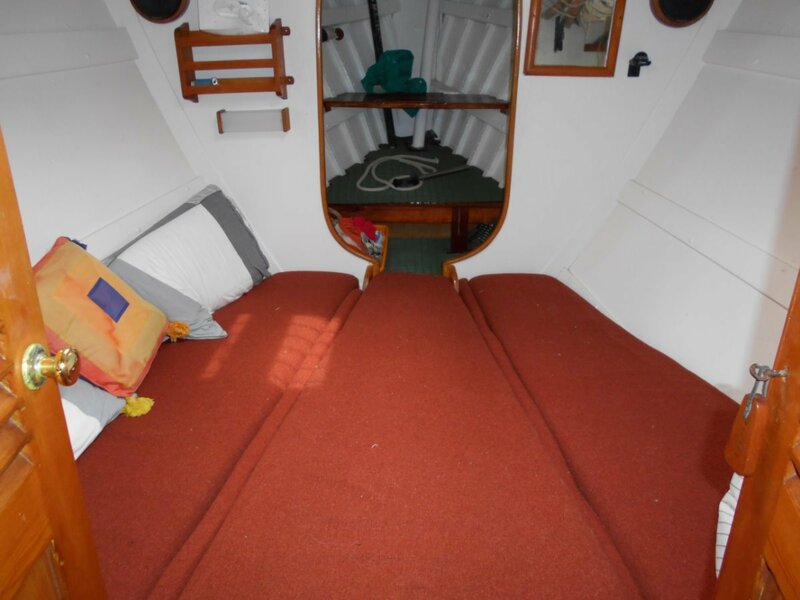 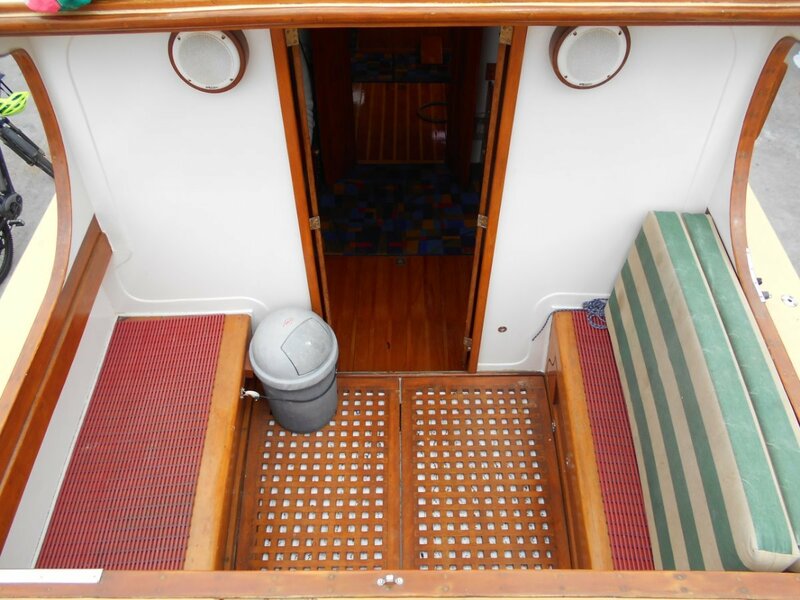 Aft into the main cabin is 2 X Single settee berths, engine is amidships with Table on top incorporating drawers. 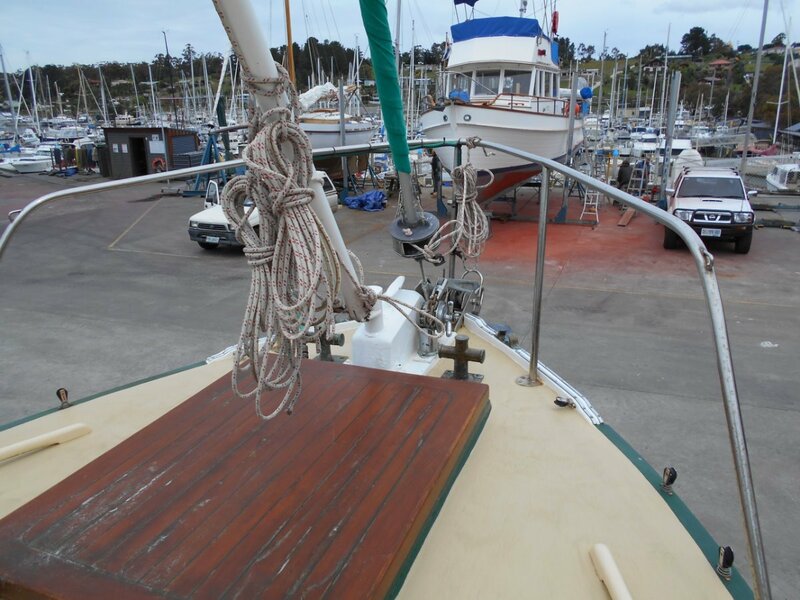 The steering position is starboard forward with all instruments and controls, Helmsman's chair and hatch above. 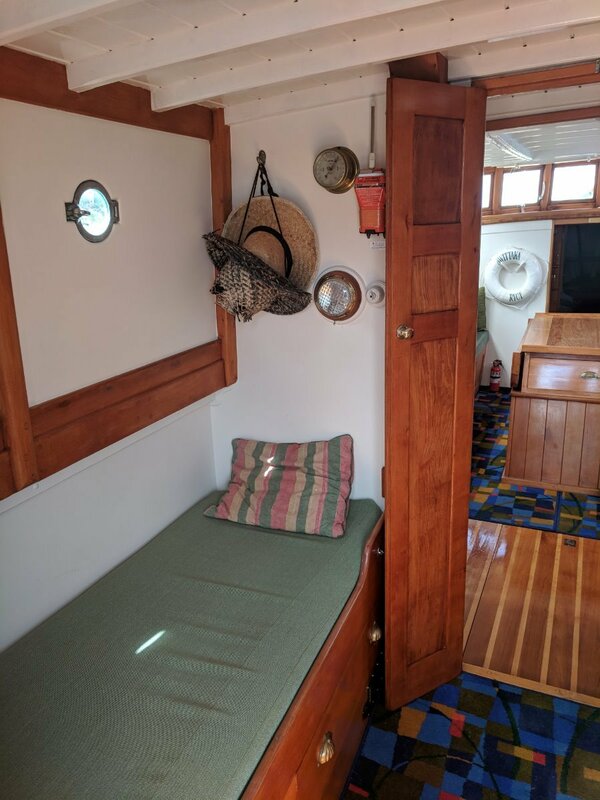 The aft end of the main cabin is the galley area. 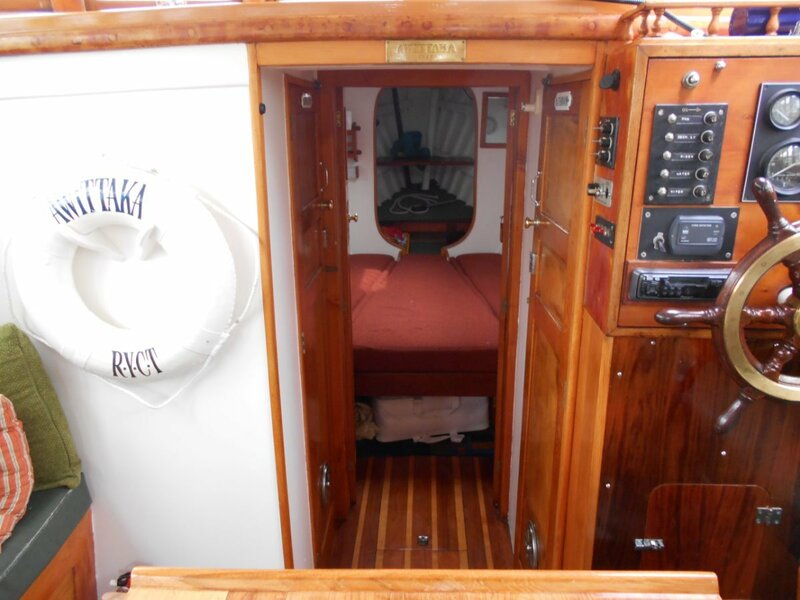 Further aft are 2 X Single berths to port and starboard leading out to a self draining cockpit with seats and lockers. 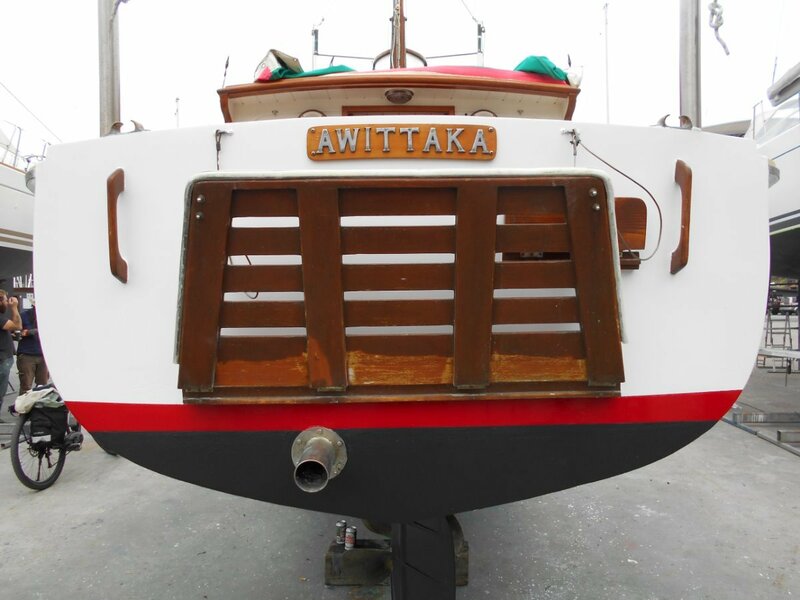 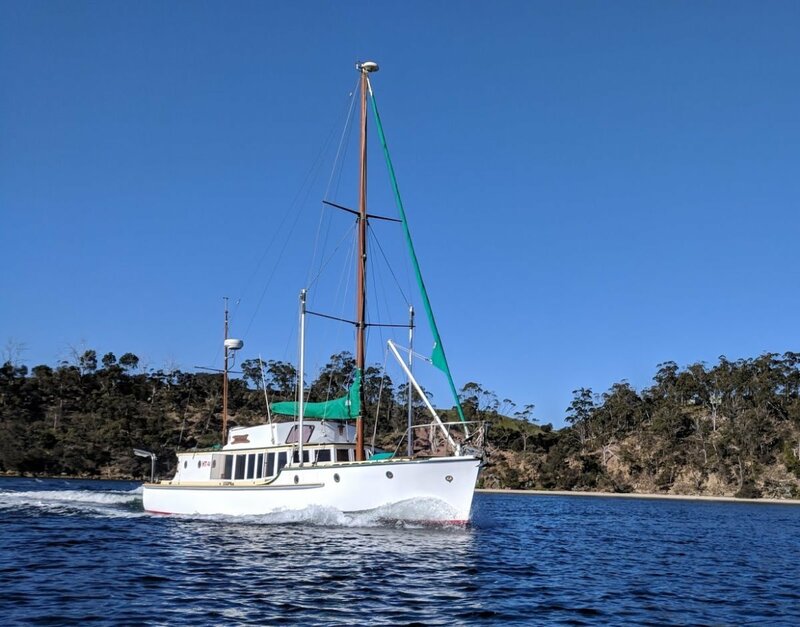 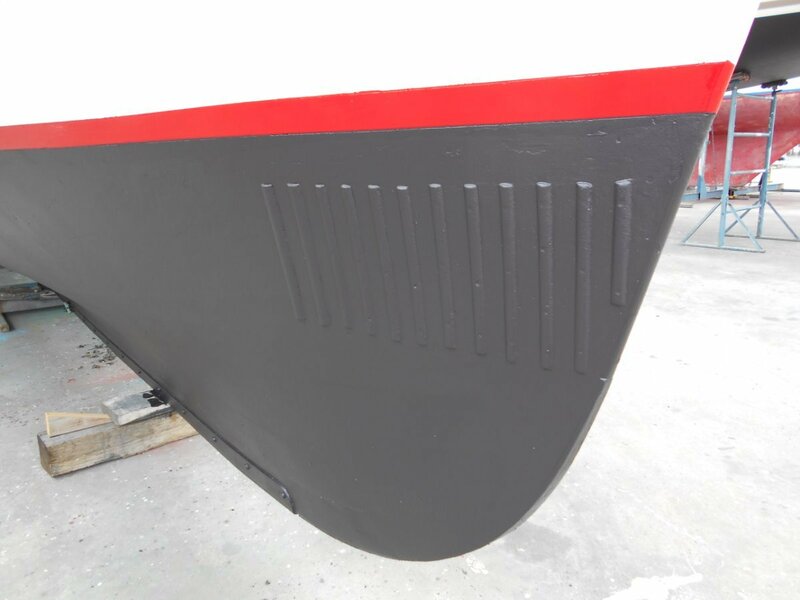 The name "Awittaka" is a native Tasmanian word for "Chief of the tribe"
The vessel has an Annual maintenance program with documented history and has been maintained to a very high standard.